With new PTS series Schurter fulfills the technical standards and the requirements of the designers. Design and Ergonomics aspects play a major role in today’s public transportation world; the so-called functionality is not the sole decision criteria. 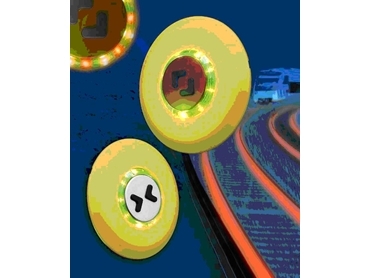 The Public Transport Switch is designed as a door pushbutton switch for usage in public transportation applications such as trains, buses, trams and undergrounds. Due to the user-friendly design the PTS switches can be easily operated by elderly and handicapped people. The switching status is visually indicated through an illumination ring. The illumination ring is lit by LED’s according to the customer request. A typical switch option is equipped with 8 green LED´s and 4 red LED´s, the red LED’s give the passenger an actuation signal that the switch was pressed. An additional option is the illumination with 8 yellow LED`s. The PTS switches can be fixed with 3 screws. These screws are located behind the front bezel and therefore, they are not visible for the passengers. The standard front bezel comes with the RAL code 1023, yellow colour. It can be lettered with braille codes and legends. A new feature of the PTS series is the tactile feedback with a lifetime of 2 million cycles. A further advantage is the illumination with a viewing angle of 180 degree, which gives a wide-range identification of the switching status. The PTS switches of Schurter are available as standard versions with 24 V and 110V supply voltage ratings and angled cables. The PTS series switches are available from Avnet.